This article will explain how you can install and add eSign fields to your existing Licence templates, and send documents out to be signed. To find out more about eSign and its benefits, see here for more information. You can install eSign within your Integrations. If you do not see the Integrations option in your menu, speak to one of the Operate Administrators in your team. Select Install, and confirm that you would like in use eSign, and agree to the associated charges. Once you agree, you will be taken to the eSign configuration screen. You can set it up here right away, or you can go to Settings > General > Customize > Licenses. to configure it later. There are a few options which you can change before using eSign. To configure, go to Settings > General > Customize > Licenses. Once eSign is installed you will see two new options here. Select eSign to configure your settings. Add a redirect URL. This will determine where recipients will be redirected after they complete the signing of the eSign document. Next, you can edit your eSign email templates. There are three emails that can be sent during the eSign process. Email to Customer - this is the email to the customer or customers who are signing on behalf of their organization. Email to Countersigner - email to the internal user who has been appointed as the countersigner. This as an optional step. You can decide which of your users are eligible to countersign your documents. 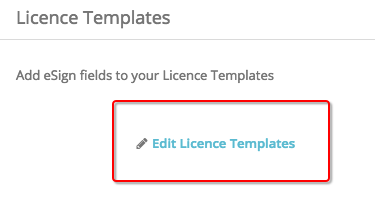 This will quickly take to you the Templates area where you can add eSign fields to your Licence templates. Your Templates come with essential pre-configured eSign fields, such as the Licencee name, signature, and signing date. You may want to add more once installing - you can do so just like with any other document template, but using the eSign specific fields. Learn more by reading the Licence Template customization guide. Create a New template, or select an existing template and select Edit. Within your template editor, you have an option to add eSign fields. Drag and drop the fields you want your customers to sign onto the Licence. 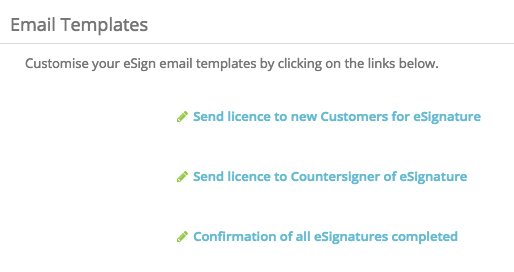 If the Licence requires multiple customer signatures, you can include multiple customer eSign fields. For example, you can add a signature field for ‘Customer 1’, and a signature field for ‘Customer 2’. This will be sent to two different customers to collect their signatures individually. Note that you must add them in numerical order while ensuring you do not miss a number. For example, if you are adding fields for two customers, you should add fields from ‘Customer Signature 1’ and ‘Customer Signature 2’, not ‘Customer Signature 1’ and ‘Customer Signature 4’. If you would like a Countersignature to be added to your Licences, you can add Countersignature fields. Initials: For example if the license requires recipients to confirm they have viewed every page an initials field can be included at the bottom of each sheet. Text Box: A text box can be included to include any extra information that you want to collect from customers. Date: To be used if the recipient is required to indicate the date they signed the Licence. You are now ready to get your Licences signed automatically. Please click here to learn more!